Whatever happened to Trump’s 2016 warning? Can Trump’s Fed nominees ensure a second term? $13.3 billion in “lost productivity” thanks to the NCAA? Has The 5 become too predictable? Two and a half years later, the shoe is on the other foot. And it fits perfectly. On Friday, the president once again held forth about Federal Reserve policy. As we’ve lamented from time to time, the president had a remarkable chance to overhaul the Federal Reserve’s board of governors — with five vacancies among only seven positions total. But for the first three appointments, it was more of the same — egghead economists, career Fed apparatchiks or both. Now, with the final two nominations, the president is finally looking to shake things up. But not in a good way. Last month, he nominated Stephen Moore of the Heritage Foundation. Last week, he nominated Herman Cain — the onetime CEO of Godfather’s Pizza and a GOP presidential candidate in 2012. Both of them have given lip service to the gold standard at one time or another, but that’s not why Donald Trump is choosing them. He chose them because they’re in line with his views about Fed policy right now. Moore is on record saying the Fed should reverse both of its interest rate increases that came during the latter half of 2018. Cain has been more circumspect, but he said in February he’s concerned about deflation — which implies he likewise thinks the Fed went too far raising rates last year. 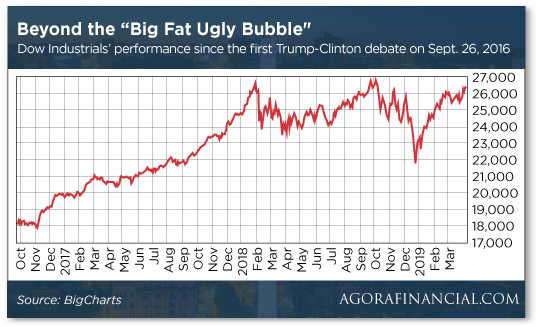 So pending Senate approval, the new guard at the Fed is keen to keep inflating the “big, fat, ugly bubble.” At least long enough to ensure a second Trump term, right? There was a profound truth in those remarks. The Fed’s post-2008 bubble-blowing policies created fabulous new wealth for the holders of financial assets. Meanwhile, the “real economy” on Main Street bumped along with the weakest growth of any post-WWII economic expansion. Median household income, measured honestly, remains slightly below 2007 levels. Main Street, seething over that disparity, propelled Trump into the White House. But a funny thing happened since then. Trump more or less implemented the agenda of the GOP donor class. Despite Republican control of Congress the first two years, he put immigration issues on the back burner in favor of big tax cuts with no spending cuts to match. And as noted here in February, the benefits of the tax cuts don’t seem very tangible or visible on Main Street. Last week, our Jim Rickards assessed a 60% probability of Trump winning a second term. 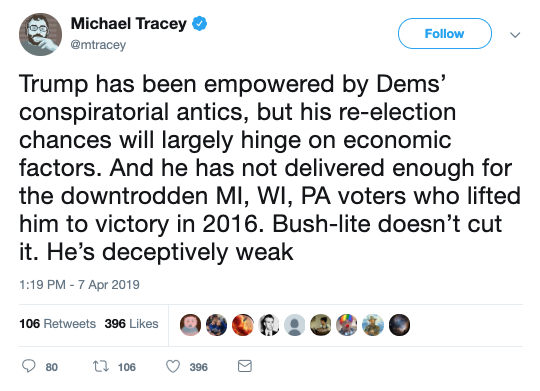 This morning, we turn to our favorite political reporter Michael Tracey. Like Jim, Mr. Tracey was among a lonely contingent that refused to rule out a Trump victory in 2016. Unlike Jim, he sees potential trouble ahead for Trump in 2020 — even if a new recession doesn’t set in. The irony is that Moore and Cain might steer the Fed more in the direction Trump wants… but it wouldn’t be enough to ensure a second term because Main Street wouldn’t see the bulk of the newly created largesse. The stock market is starting a new week in the red. The Dow is taking the biggest hit — down a little over 100 points at 26,316 thanks in large part to Bank of America downgrading its outlook for Dow component Boeing. The S&P 500 and the Nasdaq are registering more modest losses. As we mentioned last week, March and April combined typically add up to the stock market’s strongest two-month stretch of the year. But “April stands tall all on its own,” says Alan Knuckman from his perch in the Chicago options trading pits. Alan points us to data going back more than 50 years compiled by Bespoke Investment Group. April generates positive returns 66% of the time, making it the third-best month of the year by that metric. “But April really takes the cake over the past 20 years,” Alan says. “The Dow’s performance is positive 80% of the time, making it the best-performing month out of the entire year. Elsewhere, gold is again knocking on the door of $1,300 — just a buck or two shy of that mark. Crude keeps screaming higher, now a few pennies over $64 for a barrel of West Texas Intermediate. That’s a five-month high. Bitcoin appears to have left $5,000 behind after a momentous first week of April. At last check the original cryptocurrency trades at $5,221. “On the other side of the globe, Japanese railway operator JR Group is reportedly looking to add cryptocurrency payment options to its popular Suica card” — which is used by more than 70 million people. Big scary (and meaningless) number: March Madness has “cost the economy” $13.3 billion. So concludes a report from the consultancy Challenger, Gray & Christmas. “Streaming games during work hours, heading to a local restaurant to watch the games, filling out brackets or just discussing the games with co-workers will mean hours of distractions during the three-week tournament,” says the firm’s VP Andrew Challenger. At an average hourly wage of $27.66, that’s how they arrive at $13.3 billion. “I still read The 5 and newsletters of interest to me,” writes a reader as we return to reader perceptions of whether or how this e-letter has changed over the years. “I used to read or at least skim through almost everything else you sent me. Now I read almost nothing else. My reasons are simple. The 5: Clearly you respond to some form of “advertising hype” since at some point along the line you subscribed to one of our paid subscriptions. Otherwise you wouldn’t be getting The 5 via email! “Your analyses of the news have always been top-notch,” writes another, “unaffected by ‘us versus them’ thinking, unswayed by emotional arguments (thus providing an excellent example of what we in academe call critical thinking — OK, not all of us; there certainly are professors who have radically distorted the meaning of that term!) and informed by a remarkable knowledge of history, politics, economics, etc. I value greatly your informed and refreshingly independent reporting. “I do find that there has been proportionally less of such news analysis in recent years because of changes in your stable of people. You have added many investment advisers — there is a Ray, a Zach, a Tim, a Robert, a James, a Mike and I’m probably forgetting one or two (and definitely forgetting their last names; sorry, I’m not as good with names as I once was). “Being a fairly long-term reader,” writes our final correspondent, “my input is many days The 5 seems to start at 0:00 with what appears to be an insightful article that might shed some light on a particular market — then around 2:30 comes the pitch for that expert’s most recent offering. Understanding this is a free publication, I cannot help but feel I only received about 50% of what I paid for on those days! “The click-to-open ads are the same as commercials on ‘free TV’ — you can hit the mute button (not click) and thereby minimize any interruption to the infotainment. “Typically I will scan the first few paragraphs (the sunspot info last month being an exception) until a paragraph starts off “and now to the markets,” which clues me in that the pitch is over. “From that point forward the content is as insightful, entertaining, well-written and as informative as always. And yes, that includes input such as this from your loyal family of readers. The 5: Oh my, are we getting too predictable? P.S. As you might know, Congress made Social Security benefits subject to income tax in the early 1980s. But did you know many Americans are avoiding those taxes? And that it’s completely legal? With just one move, you can do it too. You can learn all about it in a new FREE book. To see how you can claim a FREE copy of this book and potentially boost your Social Security checks, click here now.